I’ve wanted to see this movie since it came out in 1995. Wait. That should have read I wanted to see this movie when it first came out in 1995. Unfortunately, I was too stupid to figure out the difference last night. 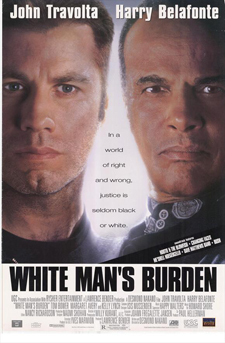 The movie asks the question “What if American race roles were reversed?” And then it doesn’t answer it. It goes out of its way to show poor white people being stereotyped by rich black people – a black man afraid of a white neighborhood, a white man who knows how to put salt on French fries, etc. There is very little reason for me to keep typing because that’s all there was to the movie. I thought it might be a social commentary but instead it just took every racial stereotype and switched it around. Wow. Super clever.